While having a clearout of files on my computer, I found this collage from a year ago this week. The Wisenheimer, an American cartoonists' internet forum that I take part in has an occasional thread called "What's on your drawing board?" where people show their latest work. 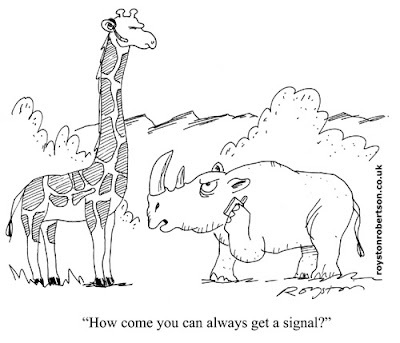 I had just put together a batch of cartoons to be sent out on-spec to magazines. 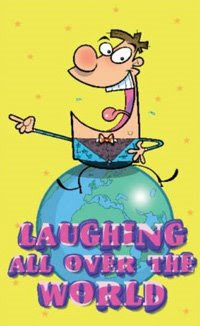 So, as I didn't want to reveal the actual jokes, I just used excerpts from each cartoon. Some people put up low-res unreadable scans. The thing that's of interest one year one, which illustrates the insanity of the gag-cartoon market, is that only one of these has so far sold! (Left hand column, one down, it was in Prospect magazine.) This, I should point out, is perfectly normal for freelance gag cartoonists! If you sell upwards of two or three out of ten that's a great result. 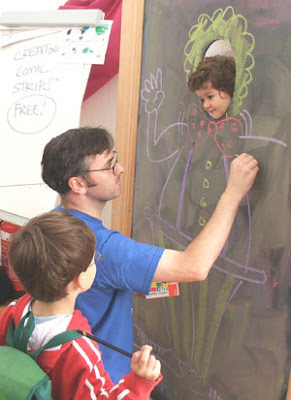 I took part in The Big Draw at Covent Garden at the weekend. 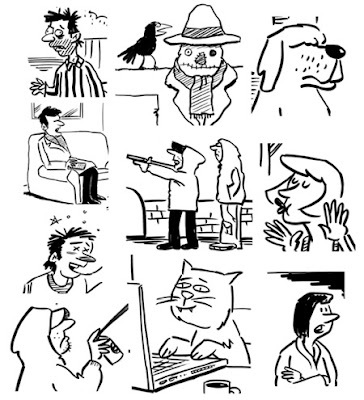 The Big Draw is an annual, nationwide campaign to get people enthusiastic about all kinds of drawing. 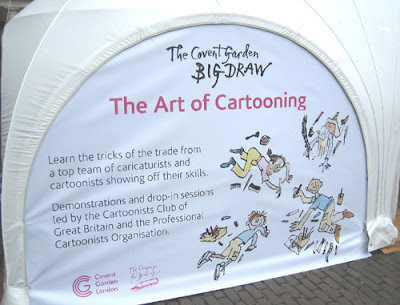 A marquee was set aside specifically for cartooning. There were workshops on strips, caricatures etc. 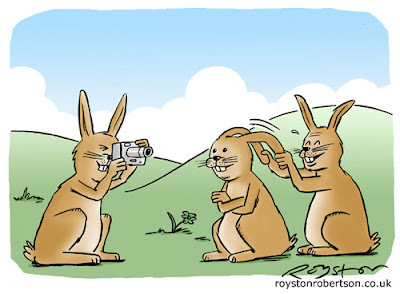 with cartoonists on hand to offer tips, advice and encouragement to those taking part. 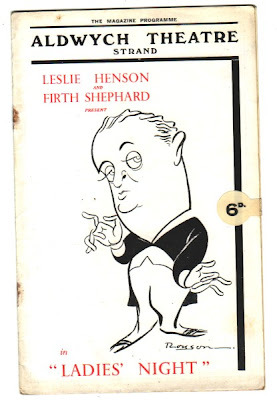 Here's me doing a spot of “reverse caricaturing” (Thanks to John Stilgoe for the pic.) This is where people put their faces through a board, like the ones you see at the seaside, except it’s blank and the participants say what kind of body they’d like. Very popular with the kids: lots of fairies, pirates, princesses, animals and a couple of Bart Simpsons. I probably had to draw a few too many girls as butterflies than was strictly necessary. All good fun though. The whole event reminded you of how much people love cartoons – grown-ups as well as kids. I hope there were some art editors from magazines and newspapers taking note! There are Big Draw events throughout the UK right now. See their website for details. I certainly wish I could draw hands as elegantly as that. Obviously it's not me, as this is from the 1930s! There is some similiarity in the signatures, but I think it looks more like "Ronson", with an elaborate "s", or it could be "Royson". Google searches have failed to turn up any info on this artist, so if anyone knows anything about "Ronson" or "Royson", please let me know and I'll pass it on. 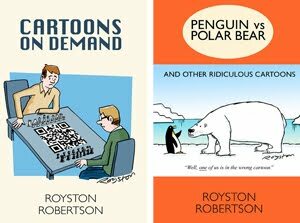 I have several cartoons in a new kids' joke and cartoon book which is out this month and is sold in aid of the Kings World Trust for Children. The Trust was founded in 1993 to provide a caring home, an education and skills training for orphan and homeless children in developing countries. Its work is focused in India, which has the largest percentage of orphan and homeless children in the world.